In the 1950s the V12 engines used by Ferrari were either of the Colombo (short block) or Lampredi (long block) design, with only a few, but very notable exceptions. Both these single overhead camshaft engines had proven successful in sportscar and GT-racing, securing wins in all major races. Halfway through the decade a new breed of much more capable machines was developed, headlined by the incredibly powerful quad-cam V8 engined Maserati 450S. At the same time, Ferrari's engineering department was reinforced by the legendary Vittorio Jano, who had come over from Lancia together with the D50 Formula 1 cars. Under his guidance young designers Vittorio Bellentani, Alberto Massimino and Andrea Fraschetti set about to develop the Colombo V12 engine for the 1956 season. In the previous season, Ferrari mainly fielded four and six cylinder engined racers, which especially in large displacement form proved hopelessly unreliable. That is why Jano's men turned back to the trusted V12 configuration for their new engine. Instead of giving them time to properly develop the engines, Ferrari insisted on fielding their work as soon as it was completed. First to roll out of the workshop were four 290 MMs, powered by a long stroke version of the 3-litre Colombo engine. These 3.5 litre machines proved immediately successful, clinching both the Swedish Grand Prix and the Mille Miglia in 1956. For Le Mans, Ferrari again turned to the four cylinder machines and all four 290 MMs were sold to privateers in the fall of 1956. Replacing the 290 MM for 1957 was an altogether more sophisticated machine. While the 3.5 litre displacement was retained, the Type 130 V12 fitted in the '290 S' sported brand new heads with twin camshafts. Breathing through six massive twin-choke Weber carburettors, the new engine produced a commendable 330 bhp. 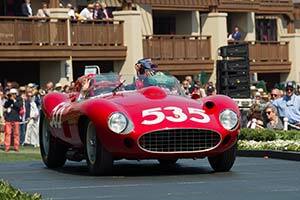 This was still well shy of the 400 bhp claimed for Maserati's 450S. Like its predecessors, the 290 S used a tubular ladder frame with independent front suspension, a DeDion rear axle, drum brakes and an elegant Scaglietti designed two-seater body. Two of these machines lined up for the season opener at Buenos Aires in January, but neither car managed to make it to the finish. Back in Italy, the quad-cam engines were further increased in size to 3.8 litre (a unitary displacement of 315 cc). For the next world championship round at Sebring in March, a brand new 315 S was constructed and one of the cars raced in Argentina was upgraded to the latest 360 bhp spec. All three cars were fielded, but could do no better than fourth, sixth and seventh in a race dominated by Juan Manuel Fangio in his 450S. For the all important Mille Miglia another 315 S was constructed and the first 290 / 315 S received more work still and it had its engine increased to just over 4 litre; it was now known as the 335 S. Ferrari also constructed a brand new 390 bhp 335 S to join the two 315 S racers and the one 290 / 315 / 335 S in the four car Works team. At the hands of Alfonso de Portago, the latter suffered a terrible fatal crash, which effectively ended the Mille Miglia. The two 3.8 litre cars were more successful, finishing first and second. It was the brief highlight of these advanced machines' Works career as starting in 1958 sports cars were limited to three litre. The surviving machines were sold to the United States, where sports car racing was still free of displacement limits. Together with the Maserati 450S, also obsolete in Europe, the hugely powerful Ferraris successfully fought off the mighty V8-engined American Specials. Ferrari had not quite given up on the twin-cam design and had a three litre car constructed, which was raced at Spa in 1958. It was not noticeably faster than the single-cam 250 TR but also less reliable, so it was abandoned after just one race. Due to the success of the quad-cam cars in the 1958 season, Ferrari built another two cars for the American market, using spare engines. One of them used the engine from the fatal 1957 Mille Miglia car and was named 412 MI or 412 S. The other was simply dubbed 335 S and delivered to Luigi Chinetti's North American Racing Team (NART) at the end of 1958 clothed with pontoon-fendered Scaglietti body. Both were raced for some time in North America with mixed results.